They sing and dance as they make their way to the arena. Marriage is a beautiful and joyous ceremony celebrated by all although each society differs from another. In Nigeria and Africa, the most common form of marriage is the traditional marriage. The traditional rites holds higher ground in the African society. 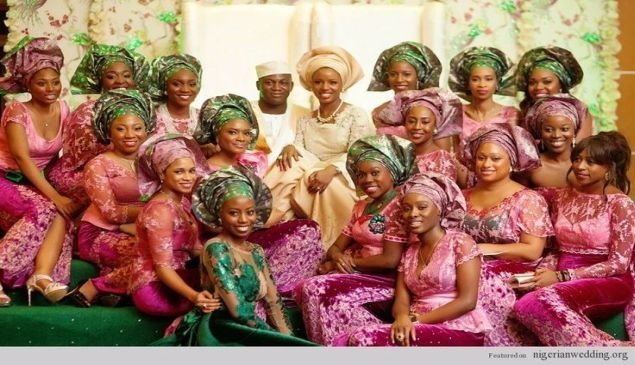 Since Nigeria, is made up of different region, getting married traditional here depends on the brides culture. We shall be talking about the traditional marriage rites of people from South east and South west. South East Nigeria is occupied by the Igbo speaking tribe. This tribe is considered to be the most industrious and enterprising ethnic group in the country as they own 30% small scale businesses. Aside the fact that they are very industrious, they also have a very rich cultural heritage and traditions, which they don't fail to showcase at any given time. Marriage to them is a family affair. It doesn't just have to do with the bride and groom alone as they have to get married to each others people. Just like their counterparts, traditional marriage (igba nkwu) is very important than the contempary church or registry wedding. Never the less, couples are adviced to do a registry or church wedding after their traditional marriage. In igbo land, when a man decides to take an igbo bride, he has to go through a process. Although it might seem lengthy, but it is usually filled with rich display of their culture and there is exicement in the air. His first point of call is to propose to his partner. After his proposal has been accepted by his partner, the groom takes his family (father and some kinsmen) to the bride's family house; this is known as Ikwu aka (to knock on the door). During this visit, the groom's father introduces himself (makes mention of any cheiftancy title he has), alongside his son and their kinsmen. He (groom's father) states the reason for their visit; which is to seek the bride's hand in marriage.The bride's father after listening to them, calls his daughter to come join them. She is then asked if she accepts their marriage proposal or not. It is important to note that the bride has the right to either reject or accept the marriage proposal in the presence of her family. 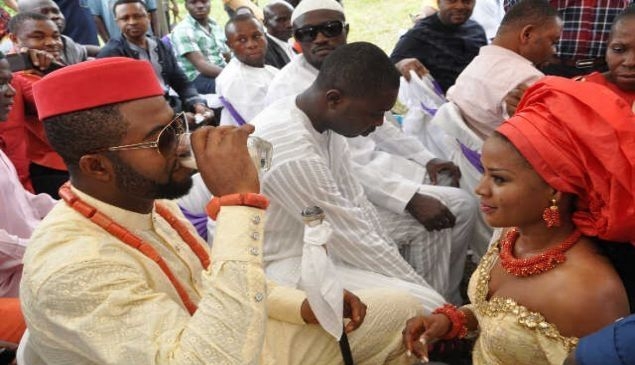 Before the traditional wedding date is fixed, the groom and his family are expected to visit the bride's family for a list and ika akalika (bride price settlement). Negotiations between the families on the amount of the bride price could take some days.All the items stated on the list is to be presented on the day of the traditional wedding and the bride price paid as well. 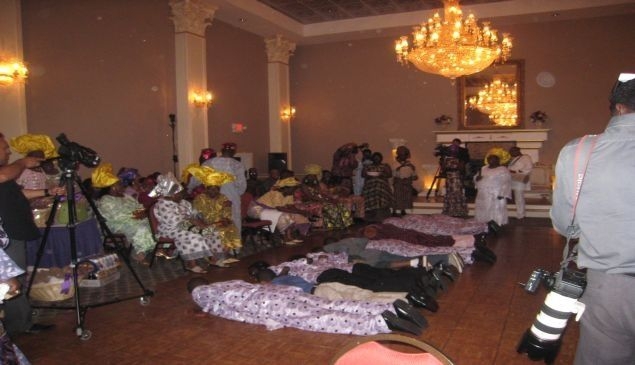 When the bride price have been settled, the groom and his family come together at the bride's family house. They hand over the money and other gift items to the head of the family and a date is picked for the wedding. The wedding can be held in the family house of the bride or a rented hall, as the family chooses. The bride and groom are clothed in the same fabric to signify the coming together of two people to become one. The bride's blouse is sown from same fabric as the groom's. The material used during this occasion could be Ghana wax fabric, Ankara, Abada or Hollandaise. The bride is beautifully adorned with sandals, earrings, necklace, wristlets, waist beads (jigida), bangles, feet and wrist chain, gold, coral beads and her body is covered in white clay (it is optional in different scieties). On her feet, she wears a brass leg ring and her toes are painted in traditional hue which is the same colour as the one choosen for the day. For her hair, she could braid or weave it with a beaded crown. Although some brides prefer to tie head tie. The dress code for the groom is a very large shirt that is decorated with elaborate embroidery and symbolism. He carries a walking stick.In a situation where the groom has a chieftaincy title, he wears a hat that identifies him as one. On his wrist and neck, he wears coral beads.The ceremony kick start with native songs and chants by women.The master of the ceremony calls out the arrangement of gift presentation. According to the tradition, each item on the list giving to the groom on his second visit, has an appropriate time to be presented. So in order not to mix up everything, the master of the ceremony states when each item will be presented. The bride makes her entrance with her friends following. They sing and dance as they make their way to the arena. The bride is expected to carry a tray of boiled egg on her head like she is selling it to the guests. This act signifies her ability to start a trade and make money for her famiy. After this, she goes to her father who gives her a wooden cup (iko) of palm wine to take to her groom. Meanwhile, the groom is sitted amist amidstrowd in order for the bride look for him. When she finally sees him, she hand over the cup of palm wine and he sips. After this, the nuptial dance is done. The head of the extended family is not left out when it comes to gift sharing. The groom presents to them traditional kolanuts, potash and heads of tobacco, kegs of palm wine, goat (s), packets of cigerates, schnapps (gin), assorted drinks and several cartoons of bear. South west Nigeria is occupied by the yoruba speaking tribe. They are considered to be the most educated in the country. This is evident in the number of academicians and professors that have been produced from that region. The way yorubas love reading is the same way they love to party (one can say they like to party like rock stars). Their love for owanbe (party) is shown in their marriage ceremonies, naming ceremonies and burial rites. Over the years, the yoruba people have had a strong relationship with Westerners and this has affected their life style. 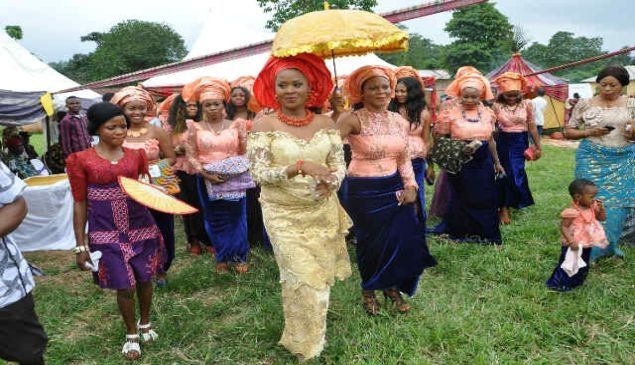 The traditional wedding ceremony in south west Nigeria is usually a very colourful event and a show of new dance steps, designer bags, outfits and jewelry. Despite been a very serious event, they don't make it a do or die affair. They ensure to bring the fun out of it. The first point of call, is for the groom accompanied by his family to pay a visit to the bride's family and ask them for their daughter's hand in marriage. Although the first visit is informal, the groom family presents tubers of yam and bottles of wine. During this visit, the both families can decide to pick a venue for the event. The good thing about the south west traditional marriage is that, the burden of food provision, venue rental is not left on the shoulders of the groom alone. The family of the bride splits the cost between them and the groom's family. In a case where the family of the bride is more buoyant, they take full charge of the cost of the wedding. In the course of the ceremony, the family of the bride gets a professional speaker called Alaga Ijoko (which means master of ceremony) . The Alaga Ijoko could be a relative of the bride or a stranger. It is the responsibilty of the alaga ijoko to ensure that the proceeding goes according to tradition. Whenever the alaga ijoko calls on the groom, a certain amount is paid and this money is kept by the alaga ijoko (one of the benefits of her job). The groom's family on the other hand, gets an Alaga Iduro (meaning the standing master of ceremony). This alaga iduro, acts as the mouthpiece of the grooms family. Just like the alaga ijoko, the alaga iduro could be a relative from the groom's family or a complete stranger. 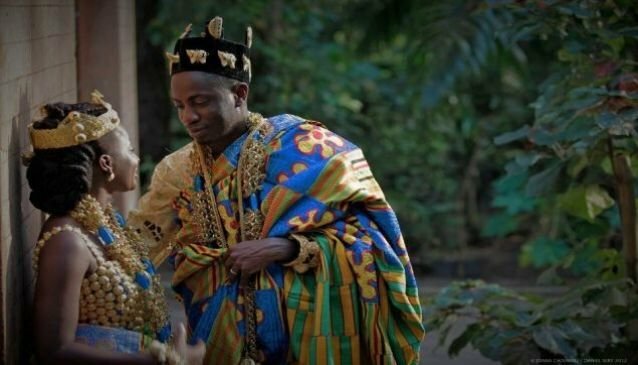 The alaga iduro speaks on the behalf of the groom's family and begs for the bride's hand in marriage. After the bride's family accepts, the groom is then ushered to seat in a big empty chair awaiting his bride. The bride is ecorted by her friends and bridesmaides. Before she makes her entrance, a letter is read to the hearing of all by a female relative of the groom asking for the bride's hand in marriage. The bride's parent makes their reply in a letter as well. The groom presents to the bride in the presence of her family gifts of : A gold wrist watch, gold earring, wax fabric, alligator pepper, bitter kola, kolanut, bag of rice, bag of salt, pure honey, tubers of yam, female shoes, bible, one aso oke material, sugar and head tie. Do you have stories to share about any wedding ceremony you have witnessed? You can start a discussion on our facebook page and twitter handle @mydnigeria.